Everyday, people around the world come up with new, intriguing, interesting and creative ideas that leave us in awe. One such group of people are the architects who bring us construction wonders that we travel across the world to see, such as the Zhangjiajie Glass Bridge in China. This is one of the most exciting construction projects to emerge in recent years. The glass-floor bridge walkway offers pedestrians a breathtaking panorama, with the Zhangjiajie Grand Canyon literary at your feet. A modern construction wonder, the Zhangjiajie Glass Bridge, located in the Zhangjiajie Grand Canyon in Zhangjiajie National Park, in Hunan Provence, China, is 375 metres in length, making it the longest pedestrian bridge in the world. And hanging 300 metres above the national park, it can also claim the title of being the highest pedestrian bridge in the world! The thought of walking across such a formidable structure may seem daunting to many, especially when you discover that it’s deck is only 60 centimetres thick. But rest assured, the bridge is of the highest quality construction. Haim Dotan, the architect behind the project, even came up with the idea of driving a forty tonne truck over this indestructible bridge to demonstrate its strength to the general public, and the results showed only a 2.16 centimeters deflection, which is impressive for such a construction. Visitors hammer the bridge to ‘test’ its structural integrity. He even encouraged people to ‘hammer’ the bridge to prove the resistance of the triple layered floor made from 12 squared feet glass panels. It was no surprise that only the top part was affected by the hits, the other two remaining untouched, demonstrating that it is capable of amortizing tremendous shocks. The structure of the bridge is designed to offer pedestrians a very safe experience by making them feel like they are walking on solid ground while suspended in mid-air. Weighing 2,200 tonnes and using steel girders, reinforced cement and side cables to sustain the entire building, this robust bridge is able to support up to 800 visitors at any one time. According to Haim Dotan, the bridge was designed to be transparent, so they used state-of-the-art engineering and design principles and methods to create a thin bridge profile, with the girder beam depth measuring only 60 centimeters. 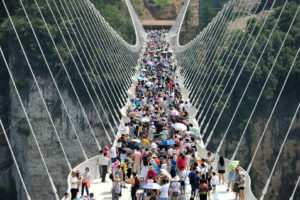 This thin bridge profile is a Chinese record in bridge technology – and the bridge design and architecture has broken another ten world records! 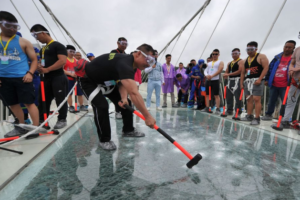 When undertaking to build the world’s longest and highest glass pedestrian glass bridge, it would be reasonable to anticipate numerous technical problems. However, this was not the case for the Chinese builders. The relatively trouble-free construction process can be attributed to the various bridge structural components being subject to strict and precise engineering studies. Gravitational rigidity, fluttering effects, or even vibrations, were thoroughly calculated. 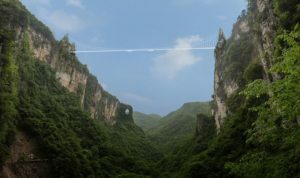 The Zhangjiajie Glass Bridge in China hangs 300 metres above the Zhangjiajie Grand Canyon, making it the highest pedestrian bridge in the world. 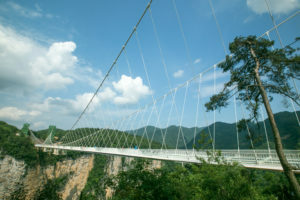 The initial design included glass hand rails, however, with safety being paramount, the bridge was completed with steel pole hand rails instead, to accommodate the high winds in the Zhangjiajie Grand Canyon. The skywalk structure also utilises fifty 500kg glass balls to reduce vibrations. Two gross water reservoirs are also stored underneath the bridge beams to diminish any movement. These shock-absorbing technologies and anti-vibration mechanisms contribute to both bridge safety and pedestrian comfort. To overcome the challenges of transporting materials through a national park, most of the component parts were assembled directly at the canyon; only raw materials needed to to transported to the site. The supporting tower foundations were dug by manual excavation, then every single segment of the foundations was casted, layer by layer. Steel cables were transported over the canyon by air cables, and the engineers utilised new technologies such as tensioning tools, suspenders, and a variety of crane lifting and hoisting attachment equipment. This is the first bridge designed by Israeli architect, Haim Dotan, and he and his team applied some peculiar aspects of engineering in the design, including bending the construction in a V-shaped pattern using the two main support cables. Interestingly, the bridge width is not constant across the length of the bridge. It varies from 15 meters wide at each end, to only 6 meters in the center of the deck. The towers supporting the cables, placed 45 meters apart on either side of the canyon, were designed to look like real stone spires covered in rock. Construction of the world’s longest and highest glass-bottomed bridge was by no means an easy task, however it is a true feat of engineering, design, and technological and architectural progression.